Italy has a lot of pasta. It's a pretty obvious statement, but it's one that I've come to love while I've been here. I've had it all'amatriciana, con pomodoro (with tomato sauce), tossed in butter and rosemary and sea salt, and frutti de mare (with all sorts of seafood in Sicily). Pasta dishes are perfect for Valentine's Day because they are always luxurious, flavorful, and colorful. Also, anyone who serves me carbs has the key to my heart (to all my single male readers aged approximately 18-23 my email is on the top right corner of this page). I picked out this recipe in particular since stuffed shells just seem fancier than regular old pasta with tomato sauce (which is still delicious!) and are also much less messy to eat. You can actually cut them up and eat them as opposed to noisily slurping long noodles in front of your date. This dish has three main components: the pasta, the stuffing, and the sauce. The pasta is easy enough; just buy a big box of big shells (mine had about 25 or 30 in it and it fit in the pan perfectly) and cook them to al dente in heavily salted water. One of the things I've noticed about Italian pasta is that they take the idea of al dente very seriously; any non-fresh pasta is cooked only until it's no longer noticeably crunchy. I do love al dente pasta but here it's a little much. However, I would recommend cooking it to the true Italian al dente here because the pasta cooks for a while in the oven and even American al dente pasta could turn to mush. If you're not big on shells, this filling works just as well for manicotti (long tubes), but you might have to break out a piping bag to fill them properly. The filling is a little more complex but still very easy. 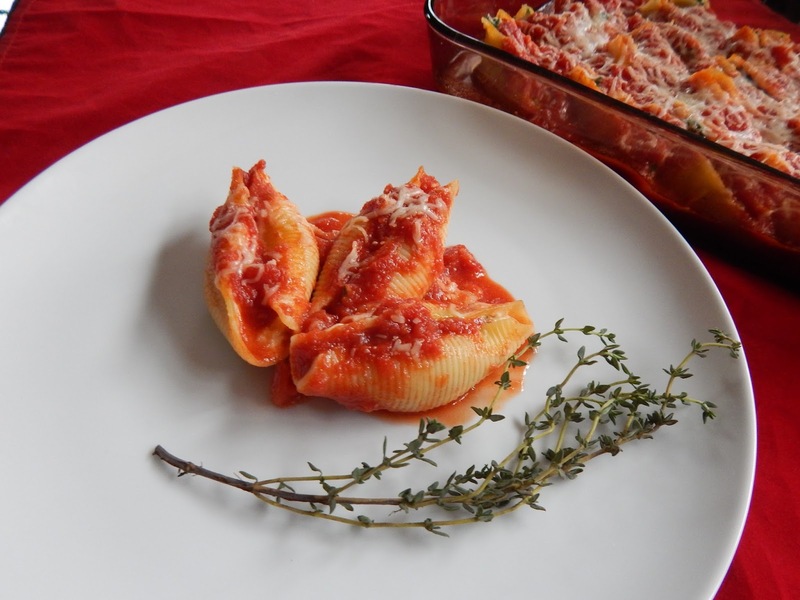 Like most stuffed pastas, the base is ricotta cheese with some egg as a binding agent. I throw in some fresh spinach, some salty diced prosciutto (you can usually find it at the deli counter instead of hunting it down at specialty stores), and more cheese, specifically parmesan and an Italian blend. 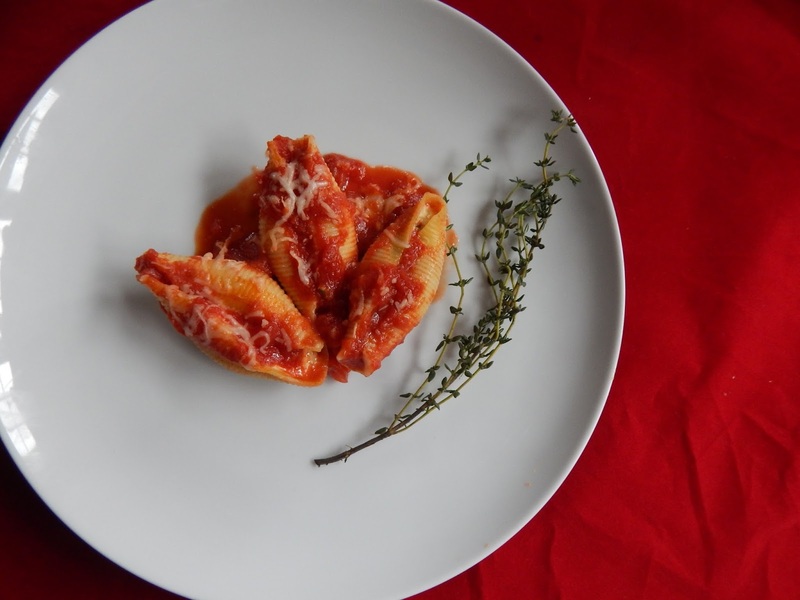 You could substitute other cheeses like mozzarella, grana padano, or provolone as long as you keep the ratio of 1/2 cup hard cheese (like parmesan or grana padano) to 1/2 cup shredded melting cheese (like mozzarella or the Italian blend). The only prep you have to do before combining all these ingredients is blanching the spinach; it reduces a lot of the bulk and retains the gorgeous green color. The sauce is just my basic San Marzano sauce. It doesn't need many ingredients because the tomatoes taste so much better than regular cheap canned tomatoes. 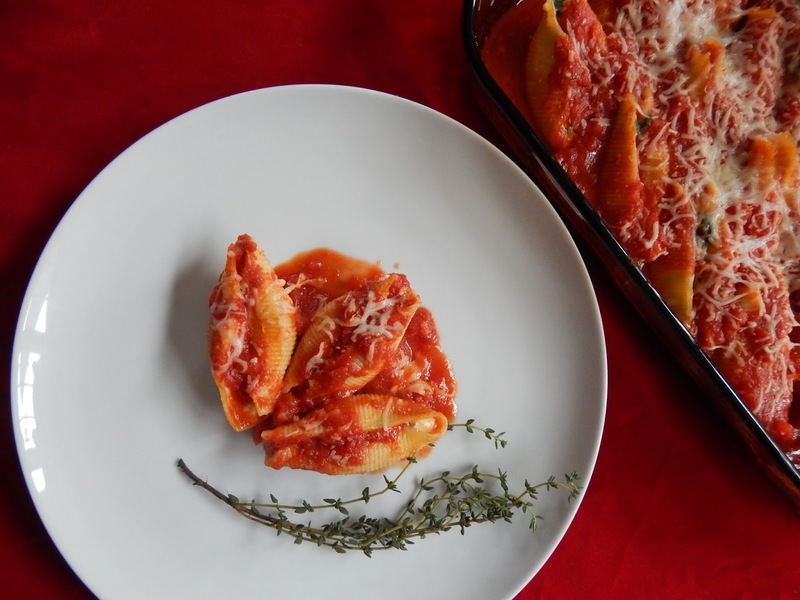 If you're making this for a romantic evening, trust me on this and splurge on the San Marzanos. I start by sauteeing some garlic in some olive oil until fragrant but not too brown. Then I add the tomatoes, a bit of sugar, and some fresh herbs. It only has to simmer for a few minutes and it's ready to go. I spread a few spoonfuls of the sauce on the bottom of a big glass baking dish to prevent the pasta from sticking and burning. I stuff each shell with either a spoon or a piping bag; you want to fill them enough so that they are plump and hearty but not so much that they overflow and you run out of filling. I've found that a big spoonful is generally pretty good. Once your baking dish is full of these beautiful little morsels, top the whole thing with the rest of the sauce. Try and get an even layer and cover all the tops to prevent them from burning. I sprinkle additional melting cheese on top to prevent the sauce and the pasta from drying out too much (and because in Wisconsin and Italy there's always room for more cheese). At this point, you can stop and refrigerate the dish if you're making it in advance. About half an hour before it's time to impress your date (or just yourself if you plan on eating this alone while watching The Bachelor... no shame), pop it in the oven until bubbly and gooey and serve with some crusty bread. I'll have the perfect dessert recipe to complete your evening in a few days. Heat some olive oil in a medium pot. Add the garlic and cook until fragrant, about 3 minutes. Stir in the tomatoes, sugar, rosemary, and thyme. Season with salt and pepper and simmer for 15 minutes. 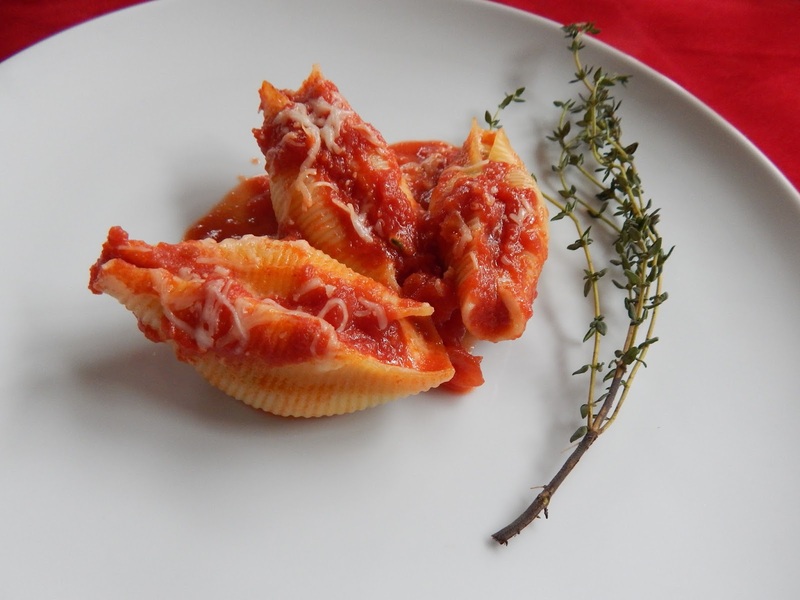 Cook the pasta shells to al dente in salted water according to package directions. Drain. Heat a large pot of salted water to a boil. Add the spinach and cook for 30 seconds, stirring often. Quickly transfer to an ice bath with a slotted spoon. Squeeze out the excess moisture. Stir the ricotta, egg, 1/2 cup shredded Italian blend cheese, and parmesan together. Add the spinach and prosciutto and season with salt and pepper. Spread a few spoonfuls of sauce onto the bottom of a 9x13" glass pan. 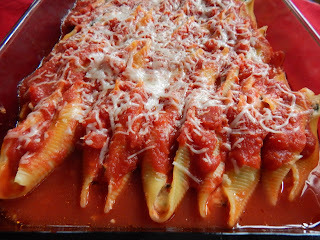 Stuff the shells with a spoonful of the ricotta mixture. Place each shell in the dish. Pour the remaining sauce on top and sprinkle with the remaining Italian blend. Bake for 30 minutes or until hot, bubbly, and melted.